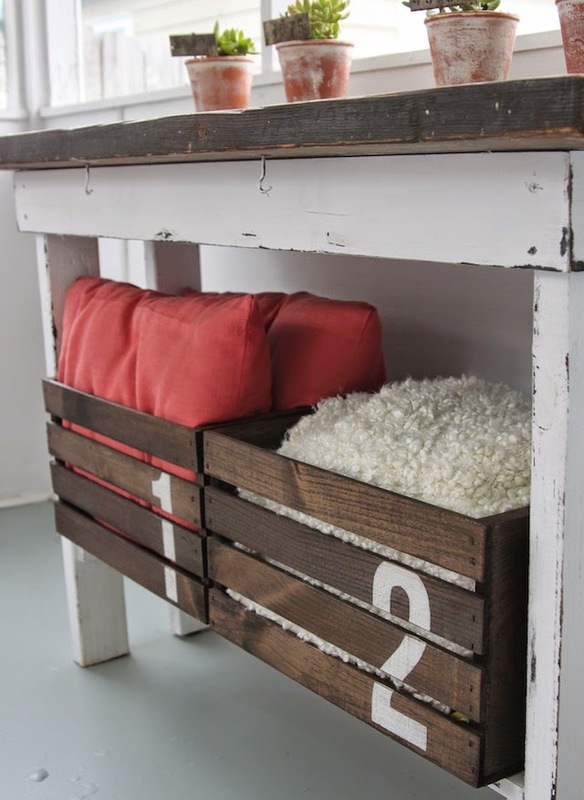 I saw up cycled crates like this on LollyJane one of my favorite blogs and knew I had to make some. I had been struggling trying to decide what I should do with my extra porch pillows and hammock and thought these crates would be a perfect storage area. You can find crates like this at most crafts stores. I found these at Walmart for about $8. I used a dark walnut stain on them. When the stain dried I stenciled on some numbers. To create the stencil, I simply printed out a 1 and 2 on some label paper and used a matte knife to cut out the number. Stick the number on the crate and paint. Then remove the sticky label paper when the paint dries. I sanded the number a little to make it look a bit distressed. They are perfect for my screened in porch.